A bad forecast for the long Anzac weekend saw us exploring the lovely huts and track system around Lake Christabel and the Robinson River. Day 1: Christabel Hut via Blue Grey River. Day 2: Crossing of Robinson Saddle to Top Robinson Hut. Day 3: Top Robinson Hut to Palmer Road. Team: Liz Stephenson, Geoff Spearpoint, James Thornton and Nina Dickerhof. 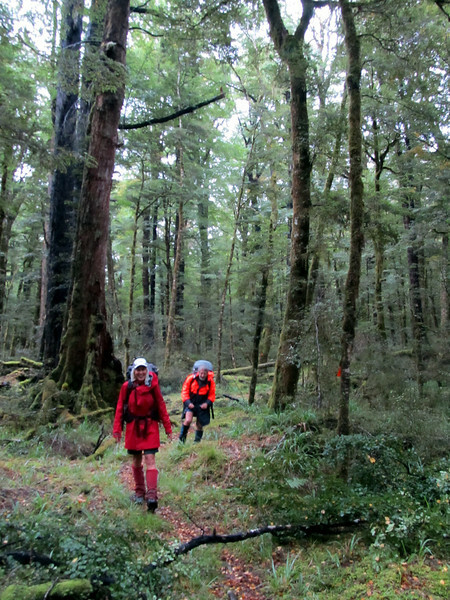 On the Blue Grey River track on the way to Lake Christabel.